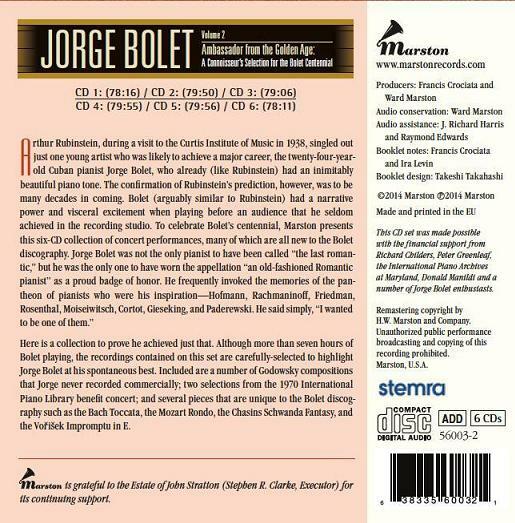 “This six-disc set is a compilation [comprising virtually all live performances] of huge importance for all lovers of the piano…[and] might help to bring Bolet more respect and admiration. Put simply, this represents one of the most important piano releases of recent years. 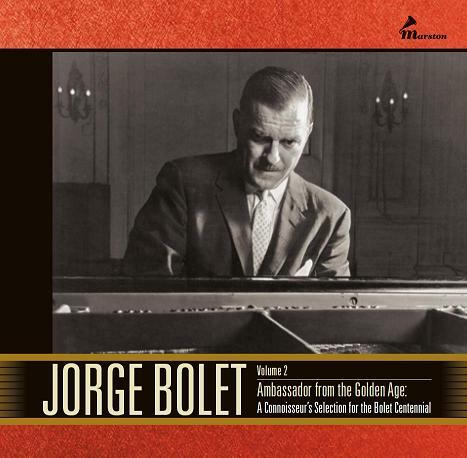 Bolet (1914-1990) was a throwback to an earlier era. The pianists he admired most were Hofmann, Rachmaninoff, and Cortot. At his best, Bolet displayed an improvisatory freedom that sounded as if the music was being made up on the spot, but that never distorted the music beyond its structural boundaries. That is the Bolet we hear throughout this wisely chosen set. Most of the performances are from the 1970s and 1980s, and are documented by Marston in the superb booklet….This might also be the place to praise Ward Marston for the transfers; he has managed a remarkable consistency of piano sound from dozens of sources ranging over many years. The sound on this set (some stereo, most monaural) is natural and warm throughout. Many of these recordings exist only because Bolet encouraged fans to record his concerts, so much of the material was recorded in house. That makes the basically good sound quality even more surprising. Most, however, of what makes this set remarkable is the playing itself. It is hard to think of anyone before the public today who plays like this. 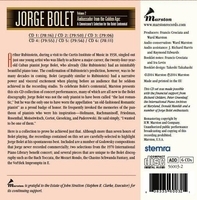 Bolet combines many qualities: beauty of tone, wonderful cantabile, brilliance of technique (there are very few missed or wrong notes throughout the almost eight hours of live playing here), an appreciation of structure but along with it a sense of fantasy and imagination that is truly rare. He will surprise you with a sudden shift in dynamics or tempo, the application of rubato in a way you weren’t expecting, but it always works, it always fits. You never feel jerked around, nor do you feel that any of these interpretive gestures are there for the purpose of calling attention to the pianist. No—this is the way he feels the music, the way he believes the piece should be shaped. While you are listening, you also believe that the music must go this way, even if it is contrary to what you thought you believed before you heard it this way. Perhaps the most impressive thing throughout this set is the astonishing range of dynamics, which retain full color at both extremes. Fortissimi are thunderous, but never harsh; Bolet always manages to keep the sonority rich. The most delicate of pianissimi also retain a full body of sound, never get thin or tinkly. Another aspect worth noting is the phenomenal accuracy of the playing. In some of the most difficult of virtuoso showpieces, not only are all the notes there, but they are there with remarkable evenness of touch and tone. In the most frenetic passagework, every note is articulated with precision and just the right touch. And then there is the sense of sheer pleasure in playing, of fun, of improvisatory freedom, that makes you know that each performance you are hearing is unique. You just know that the next time he plays the same piece it is likely to be different, even significantly so. Two…performances must be noted. One is the Liszt ’Don Juan Réminiscences’ from a 1975 New York recital. This stands with the famous Simon Barere live recording at the peak of what is possible in combining flamboyant virtuosity with genuine musicianship. On one level this music is about the physical thrill of superhuman accomplishment at the keyboard. But it is also one very serious musician’s take on the music of an earlier genius—Liszt channeling Mozart. Bolet demonstrates here, as he did in the Verdi and Donizetti transcriptions elsewhere in this set, that he understood singing and the fact that a vocal line lies at the base of this music. The sonority is rich, the flair and accuracy remarkable. This is the performance of a master. The other performance that cannot be ignored is the Liszt TANNHÄUSER transcription from a Carnegie Hall performance on 16 April, 1989. "Despite his accolades, Jorge Bolet had a peculiar career in that he did not achieve international success until he was in his 60's. From his days as a child prodigy at the Curtis Institute in Philadelphia, there never was a doubt about his phenomenal talent. His technique ranked with that of any living pianist, he drew a rich sound from the instrument, and he even won a major competition - the Naumburg, in 1937. Not until the 1970's was he recognized as a great master. Many who had followed his career from the beginning saw a deepening in his musical thought around that time. Whatever the reason, he suddenly started to receive rave reviews; he signed a big recording contract with Decca in England and played a series of engagements that took him all over the world. At one point he was giving some 150 concerts a season. He himself professed to be puzzled about his sudden fame. One of the factors in his sudden success was a shift in musical values. When Mr. Bolet was young, the musical climate was largely anti-Romantic. Liszt, especially, was regarded as a meretricious, show-off composer. It followed that musicians were trained in an anti-Romantic style, a style in which little metrical or even expressive latitude was allowed. The idea was to play all the notes exactly as written, bring out the architectural design of the music and keep expressive devices to a minimum. Mr. Bolet described this kind of interpretation as bound to ‘a rigid set of absolutes’. Its exponents, he said, ‘have computerized mechanisms, but so many seem to have no idea of what the notes actually mean’. To the new generation, his playing must have seemed anachronistic. At age 12 he was sent to the Curtis Institute, where he studied with David Saperton, Leopold Godowsky, Moriz Rosenthal and Josef Hofmann. These were remarkable pianists who were exponents of the Romantic school, and Mr. Bolet grew up to be a worthy successor to his great mentors. The two pianists he admired most were Hofmann and Sergei Rachmaninoff. As Mr. Bolet pointed out many times, the true Romantic style was anything but anarchic or self-indulgent. The great Romantic pianists of the past were aristocratic artists who never distorted music, who had tonal beauty, who used expressive devices that consisted largely of delicate fluctuations of tempo. ‘Flexibility within the pulse of the music’ was how he described it. In the 1970's musicians started looking at the once-derided music of Liszt and other Romantics, and a wave of neo-Romanticism was in the air. Then Mr. Bolet finally came into his own. He was one of about a half-dozen veterans who could convincingly bring Romantic music to life. He had a colossal technique that never was used for its own sake; at all times his playing was subtle, refined, elegant. He could summon great masses of sound when necessary, but like the great Romantic pianists he never pounded. In a day when the prevailing piano sound was percussive, his hands seemed made of velvet, and he drew luminous, tinted sounds from the keyboard in great washes of color. It might also be said that his tall, stately, dignified figure brought to the concert stage an element of glamour that had been missing from the younger generation. His playing was not admired by purists, with whom he had a continuing battle for years. He pointed out that the greatest composers of the past would give a trusted performer considerable latitude. He stated that music on the printed page meant nothing: it had to be brought to life by a performer, and any decent performer had to work through thought and instinct, ending up reflecting the composer through his own personality. He had no hesitation making changes in some of the music he played, though the changes were so discreet that none but professionals could have noticed them. ‘It is a performer's responsibility’, he said, ‘to do what will best put across the piece he is playing’. He also tried to pass his style to his students. Mr. Bolet did a great deal of teaching. He was active for some years at Indiana University and then went to Curtis, where he eventually succeeded Rudolf Serkin as the head of the piano department. He felt a moral obligation to teach. ‘I have received knowledge and experience from the great masters’, he once said, ‘and it is now my responsibility to pass it on to the next generation’.